← Flip, Float, Fly a Perfect Book for Right Now. When this book came out, I knew I had to have it. No, not for my grandchild, although I’m sure I will read it to her in the future. This one is for me. You see, I really am afraid of storms. If it even looks like a tornado could form, I’m down in my basement. The story is told that when I was very young, I was standing next to our barn when lightning struck its lightening rod. All I remember is my mother’s scream. I was completely unharmed, but that clinched it. I do not like storms. 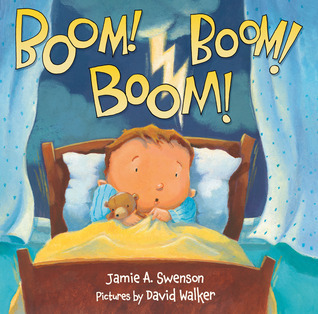 The small boy in Boom! Boom! Boom! settles into bed with his stuffed bear, Fred. When thunder starts crashing around outside they are joined by the dog. Pretty soon the cat joins them, then guinea pig, frog, parrot, snake and finally, “Sis jumped in with elbows flying. The bed groaned, and creaked and then stopped trying.” In the end, the small boy figures out a solution to the destruction in his room and finally gets some sleep. The cadence of the rhyme makes this one of those books that is just as much fun to read for the adult as well as the child. David Walker’s eye-catching illustrations will appeal to the youngest child. But beware! They may want to bring all their toys and pets to bed with them.